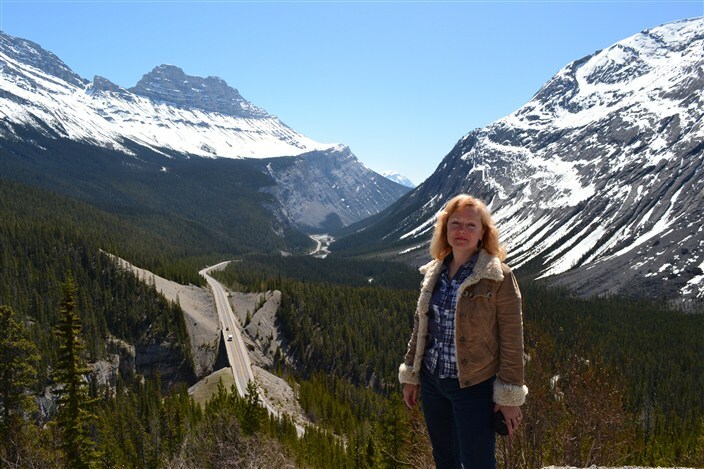 If you love driving scenic mountain highways, have I got a trip for you. 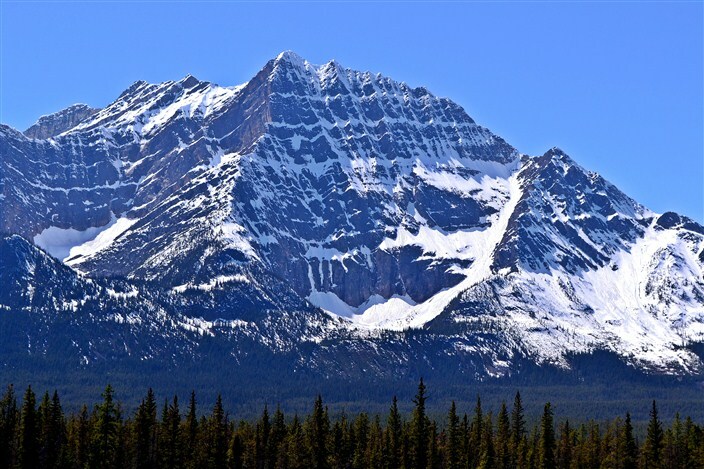 Highway 93 (commonly referred to as the Icefields Parkway for reasons abundantly obvious when you take the trip) which runs from Lake Louise in Banff National Park to the town of Jasper in Jasper National Park, will exhaust your supply of superlatives. This one has absolutely everything you could ask for: serrated peaks, hanging glaciers, cascading waterfalls, pristine lakes and rivers, forests without end, wildlife sightings, sweeping valley vistas, you name it, you got it. 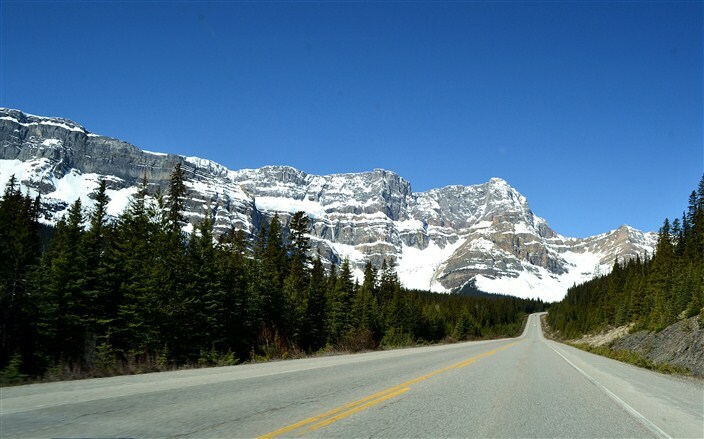 At 230 kilometers in length (140 miles) the Icefields Parkway packs more spectacular views per mile than any comparable road this traveler has ever driven. It honestly is a challenge to keep your eyes and attention on your driving, not just occasionally but nearly all the time. Within the first half hour I’d lost count of how many times I stopped the car to gawk and take photos. Luckily, two factors made this relatively easy to do. One, we were there in May and traffic was light; two, there are plenty of pull-outs along the way designed specifically for this purpose, and I think we took advantage of every single one. 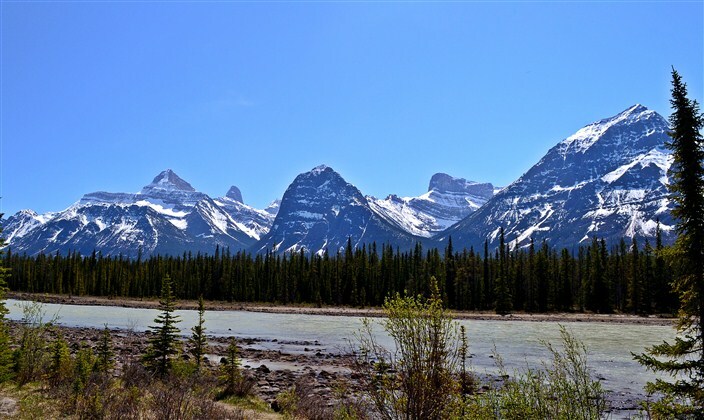 We traveled the road from south to north, beginning in Banff National Park and ending in the town of Jasper. 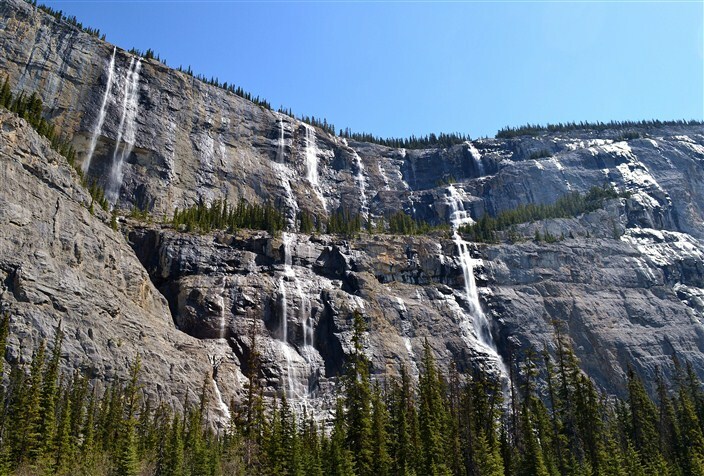 There are so many things to see it’s nearly impossible to recommend specifics, but the can’t miss sights would surely include Crowfoot Glacier, Peyto Lake, Saskatchewan Crossing, Weeping Wall Falls, and the Columbia Icefields. We were fortunate enough to visit all of them with the exception of Peyto Lake. The side road going up to Peyto was closed due to the pavement still being buried under several feet of snow. A disappointment to be sure, but not a surprise in May as this is the highest point along the way at 6,850 feet elevation. But with so many other attractions it hardly mattered. 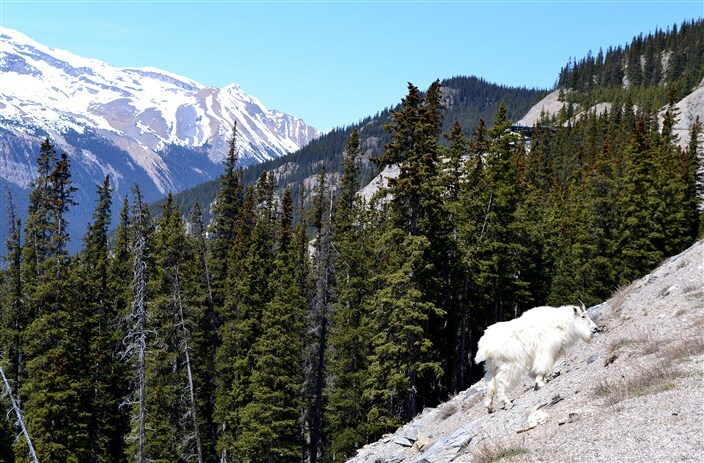 If, however, you go later in the season and the road is open, drive to the parking lot at Peyto Lake and pull on your hiking boots. 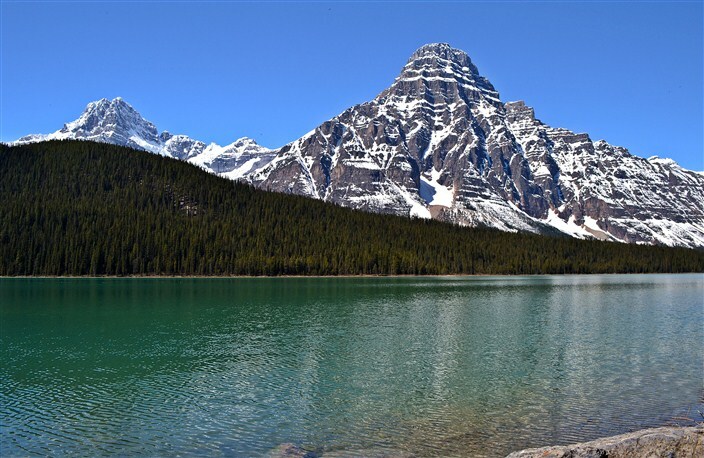 Here you can hike a 10-minute paved trail to the Peyto Lake viewpoint and witness the amazing emerald green waters of Peyto Lake. If you have more time, continue along the old fire road to the Bow Summit lookout. This is about 2.5 hours round trip, so bring your lunch. 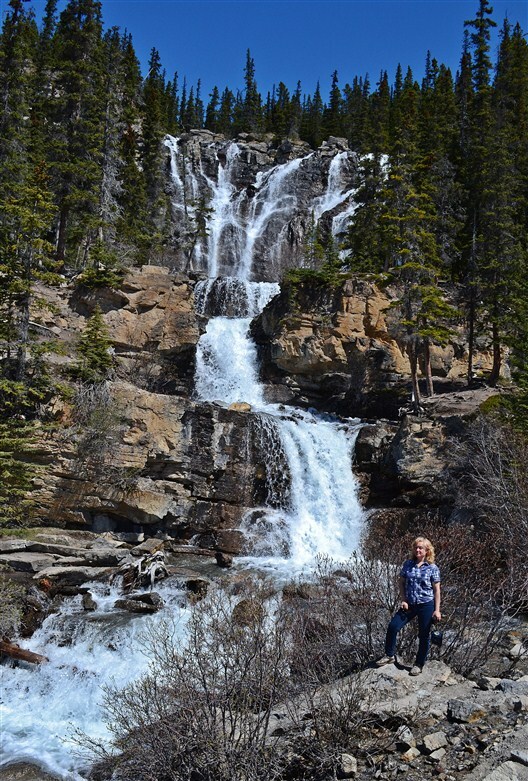 Other popular Parkway hikes are at Bow Lake and Sunwapta Falls. 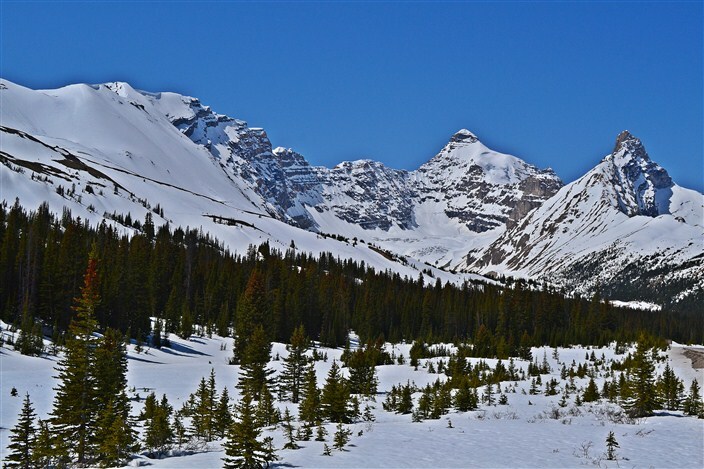 Crowfoot Glacier is not only beautiful to view but instructive as well. Signboards with photos taken almost 100 years ago clearly show the dramatic retreat and shrinkage of the glacial mass on the mountain then compared to what you see still on the mountainside today. No matter what side you fall on in the climate debate, it’s obvious to see the difference. Weeping Wall Falls has to be one of the most aptly named places I’ve ever been. 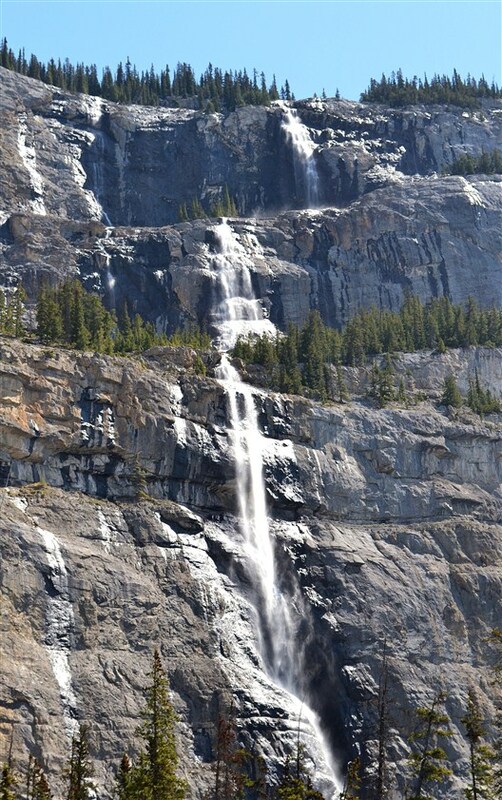 A sheer rock face several hundred feet high is covered by as many as ten separate waterfalls grouped closely together and sheeting over the rocks to the ground below. Don’t miss it. 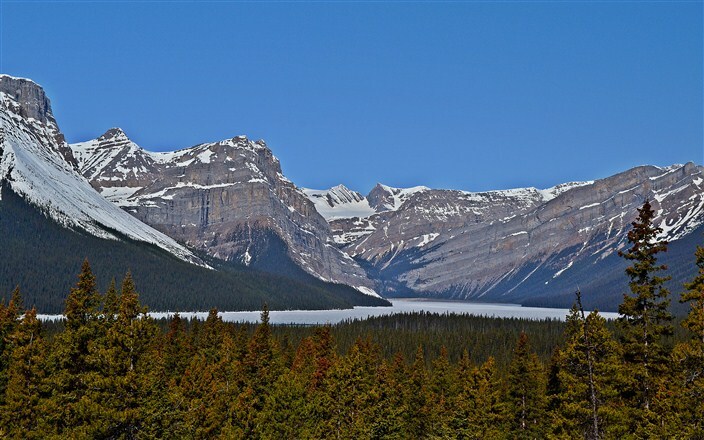 If for some reason you don’t feel like driving all the way to Jasper and instead want to head east out of the parks (why anyone would want to do this I have no idea) Saskatchewan Crossing is your one and only opportunity to do so while driving the Icefields Parkway. It’s also the only place along the Parkway to get gas – at a significantly higher price – if you were foolish enough not to fill up before embarking. 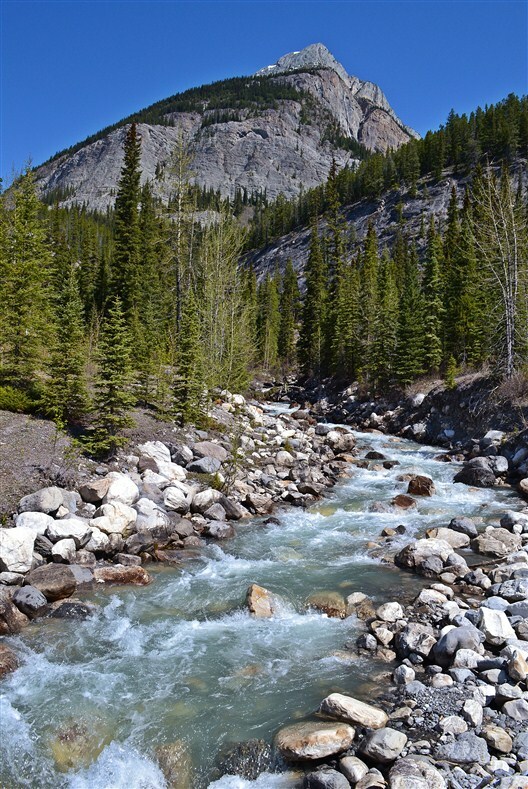 At first I wondered why the area is called Saskatchewan Crossing when it’s in far western Alberta and a looooong way from Saskatchewan, but then I realized it’s because here you cross – and recross – the Saskatchewan River. Okay. 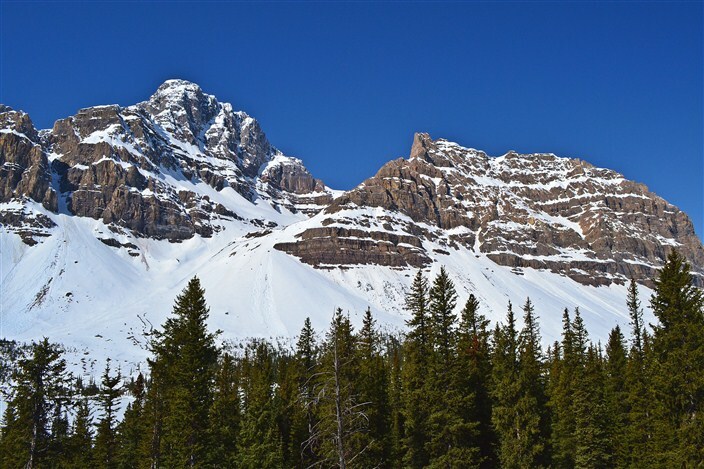 So if you’ve had enough stunning mountain scenery for one day and just can’t stand to see one more snowcapped peak, jump on Highway 11 and head east to Red Deer. Otherwise, keep heading north. Next stop, the Columbia Icefield Interpretive Centre. 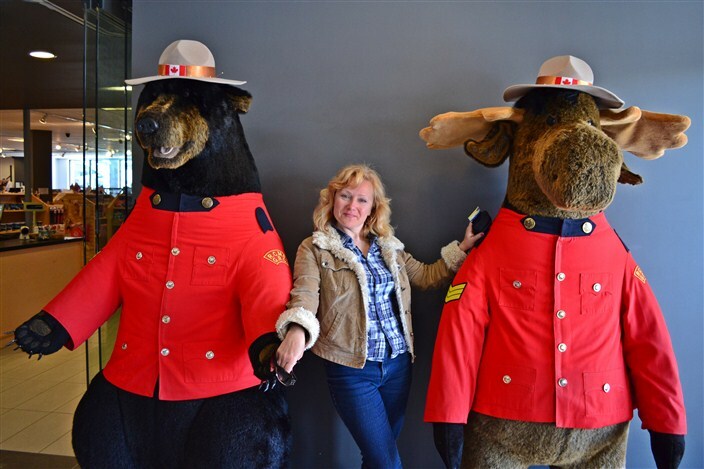 Here you can buy a ticket and board an Ice Explorer that will take you right up onto the Athabasca Glacier, where you can walk on ice as thick as the Eiffel Tower is tall! It’s not cheap, about 75 bucks Canadian, but it’s safe to say the average person would never get this far out on a glacier under just about any other circumstances. From here to Jasper is about another 100 kilometers with absolutely nothing to see. Just kidding. 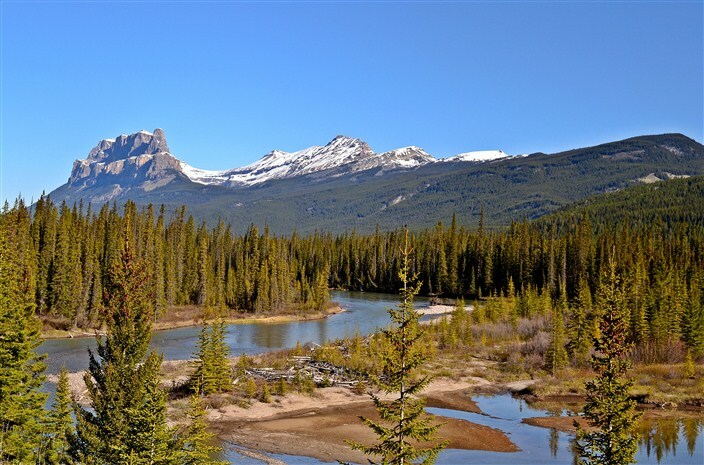 Jasper National Park is every bit as scenic as Banff and the rest of your drive to the town of Jasper will be spectacular, amazing, awe-inspiring…well, like I said earlier, choose your adjective. Take your time, stop often, enjoy the ride. You’ll never see anything else like it.